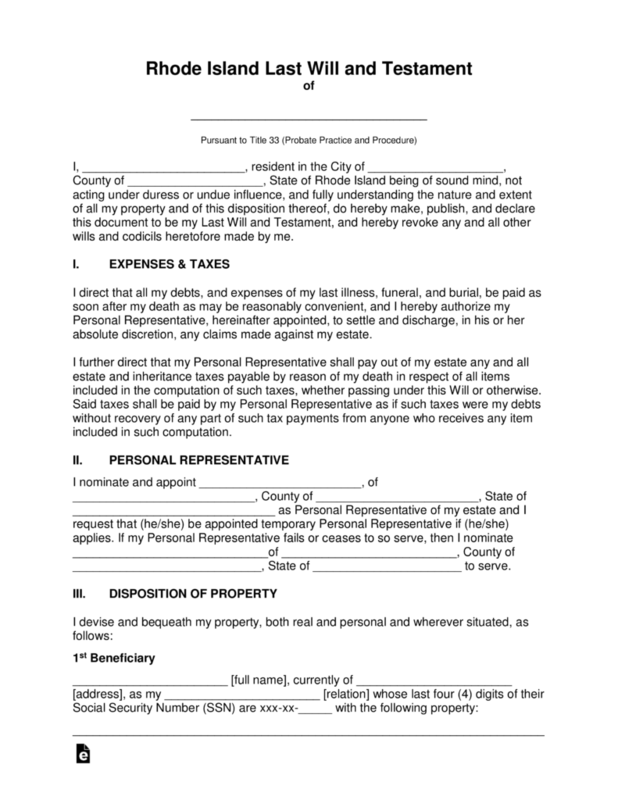 The Rhode Island Last Will and Testament is a document that is set fourth by a testator to make known their desires with regard to precisely how they would wish to have the distribution of their estate to be executed upon their death. The document would reflect the desires of how the testator would wish to see the continued care of their families while they are no longer available to carry out their familial duties. 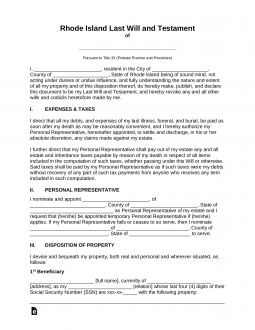 This document may not only provide for spouse, children and/or extended family but this document may also provide for selected organizations, educational institutions, friends and/or others. The document, once completed, must be witnessed and signed by two witnesses. As well, all signatures will be acknowledged by a state notary public. This document may be revoked or changed at the discretion of the testator. Signing (Section 33-5-5) – Must be acknowledged by the testator in the presence of two (2) or more witnesses present at the same time, and the witnesses shall attest and shall subscribe the will in the presence of the testator. Step 7 – Notary Public – The remainder of the document, will be completed by the notary as required, once all signatures have been properly witnessed.